Hello Friends! This weeks challenge is extra special! 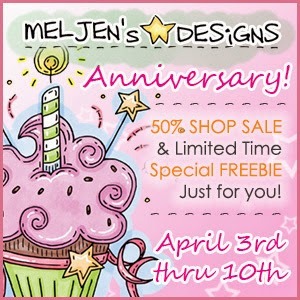 We are celebrating MelJen's Designs, 4th Anniversary and we are giving all of you an extra special gift..A FREE digital stamp, created especially for the occasion! The challenge is to use the 4th Anniversary image, All Our Friends, on your project. We are so excited to see what you create. Isn't this such a cute image?! And it was so much to color. Here's a little fun fact: the children in the image are actually people in real life! They are Melissa's kids! Pretty cool, huh? Well, what are you waiting for?! Buzz on over to the Shop, grab your FREE digi and get busy! And while you're there...enjoy another extra special gift...Melissa has put the entire Shop on sale for 50% off! Now is the time to snag some of those images that are on your Wish List. I hope you make some time to play along with our Anniversary Challenge. You could win FREE digital stamps of your choice. Just make sure you use the Anniversary digi on your project, in order to be included in the random drawing. Oh golly, how fun! 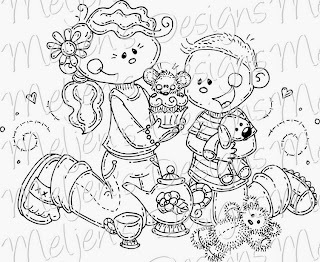 You've done an excellent job coloring this terrific freebie (lucky us). So colorful. Very neat that the kids are Melissa's kids. I love the sparkles! This is adorable, Barb! Fun colors and perfect sentiment.